Lil' Buddy is an 11 year old male, fawn pug. His birthday is August 24th. He enjoys sleeping, eating, and hanging out. He howls (in tune!) to opera. He doesn't ever bark at other dogs, only the FedEx and UPS drivers. He has fetched a rope toy a few times but mostly doesn't see the point. He is a faithful companion. He knows when baked goods are ready and makes sure nothing ever burns as he howls when it's ready...he's better than the oven timer!!! He loves to eat. He prefers carbs and meats and walks away from fruits and salad. He will suffer a green bean (the vet said he would love green beans! ), but only if it's cooked in butter and parmesan cheese. Clever boy. We're all doing well here some days it's a little to hot to be out but,we have days we can so we enjoy those days.Glad evi-si is doing well mine are sleeping now also i've got snoring in stero love watching them sleep.Hope you and evi have a nice day hugs to evi take care. Hello Evi-Si hope your having a good weekend as we are here had to pop in and say hi to you.What a precious face you have just want to give you many kisses we love you here sweetie and enjoy just sitting here and looking at you.many hugs and kisses being sent to you angel babe. You are such a sweetie i love all the photos you are so precious i just love my seniors i love your sweet face you stole my heart many hugs being sent to you. The four kids say that we would all really enjoy being your friend, and what a wonderful looking little guy you are, excellent! Welcome Eve to you and Lil Buddy. Look at this fella! 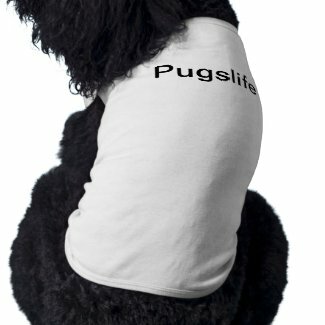 Welcome to Pugslife, fantastic place and fantastic pugs and people that make it such. Welcome again from my household.